Mainly tightly wooded holes with a few open field holes mixed in. Garden State Pkwy; Exit 63. Go east on Rte 72 to a right on Roosevelt Blvd (Kmart), immediately left on Washington Ave. Becomes Doc Cramer Blvd at the light. Go 0.5 mile to a left at the 4-way stop. The parking lot is on the right (Pop Warner Football Fields). Park near the end of the parking lot. 1st hole is just behind the guard rail on the right side of the lot. 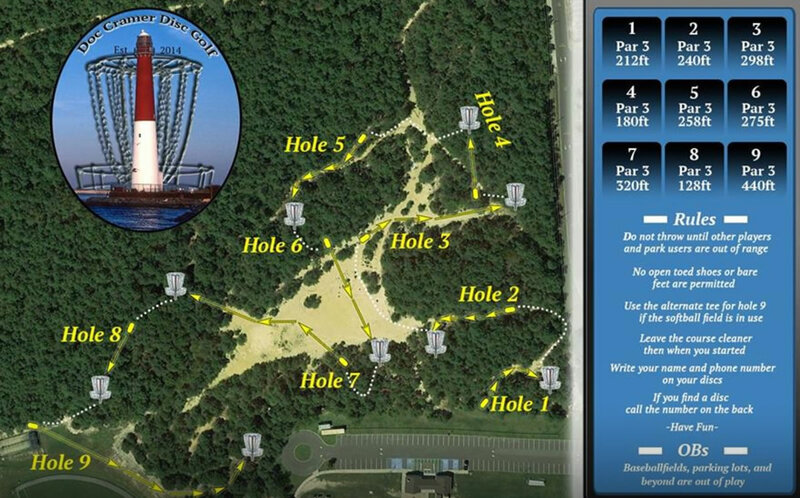 Fun and challenging 18 basket course in the woods with sometimes fairly narrow fairways. All tees are now brick pavers and are currently marked with helpful signage. Most holes are par 3 with a few par 4 and one par 5. Baskets are visible from the tee on about half the course, the rest are dog legs. Great course for all players to learn but still a challenge for seasoned guys. There were some trees left in the fairways and the surrounding areas are densely wooded. I'm hooked. This course has been removed and is not there anymore.